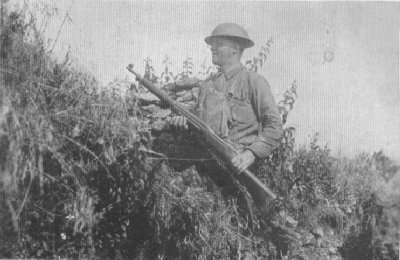 Member of Company B, 325th Infantry, 82nd Division, in our last outpost No Man's Land. Regnieville, July 1. 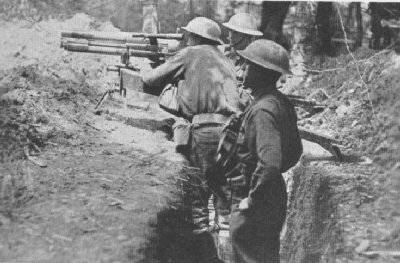 French "37", a one-pounder, in firing position on parapet in second line trench. This gun has a maximum range of a mile and a half, is more accurate than a rifle, and is capable of firing 28 rounds a minute. Headquarters Company, 126th Infantry. Dieffmatten, June 25, 1918. Early in the war, only high explosive shells were used in trench mortars. Because of their large shell capacity, they were later adopted for launching gas attacks, frequently being lined up hub to hub. 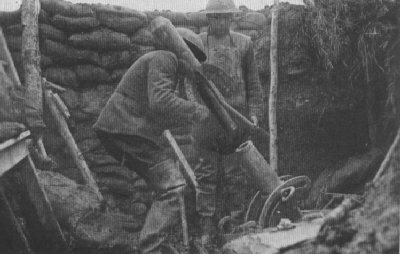 Mud and water in the trenches made the operation of these mortars extremely difficult.